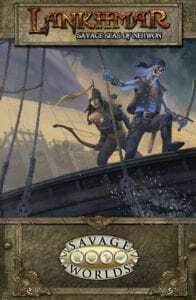 Just a reminder that the Pledge Manager for Lankhmar: Savage Seas of Nehwon*officially sets sail on the 28th of this month! Visit the Pledge Manager today to upgrade your original Kickstarter pledge or become a late backer. With just a click or two, you can upgrade your rewards or add on bundles, dice, Bennies, Boxed Sets, and more including our custom set of Lankhmar Miniatures sculpted by David Soderquist of*Bronze Age Miniatures. This set features sculpts of Fafhrd, the Gray Mouser, Ningauble, and Sheelba. We’ll keep*the Pledge Manager*open until September 28th, so make sure you reply by then or shipping costs may change, especially for our international customers (we use freight forwarders for our international customers…if you literally miss the boat, we have to send it by more expensive means!). Sign on with the crew of our*Lankhmar: Savage Seas of Nehwon Pledge Manager*today!